Microsoft is to phase out pop-up and pop-under web adverts on most of its global MSN websites by the summer. Results of research showed the company what most web users knew already - that they do not like them. The ads will not be allowed on MSN's UK, Nordic and Belgian sites, with the ban extending to other countries soon. MSN, which has about 350 million global visitors to its sites, is the latest to ban pop-up ads after AOL started to block them from its US sites last year. 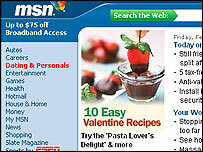 MSN started to block pop-ups on its US sites at the end of 2003. "[We have] taken the decision to no longer sell pop-up and pop-under ads. Local countries will make the change at the best time to suit their local market needs and to meet pre existing arrangements with MSN customers," a spokesperson said. "Removing pop-ups and pop-unders on MSN is a win for consumers, advertisers and our partners." Microsoft has recently been working with online ad developers, Unicast, to come up with a new kind of adverts for the web. They have been trialling 30 second-long TV-style ads that appear at random when users click on certain websites. The new video ads are being tested on 15 sites over the next five weeks, including MSN, ABCNews, Pepsi and Honda. There are browsers and free tools on the net which give web users the ability to block pop-up adverts already. Yahoo and Google both started to offer pop-up blockers in early 2003. Some versions of Internet Explorer also have the ability to restrict sites and block ones with pop-ups, but this has to be set by the user manually. Pop-up adverts have evolved since the early days of the net, as websites try to attract more users, and online business becomes more commercially successful. Advertisers have tried to come up with different ways to entice users into clicking on their adverts. Many have users chasing them around their screens in order to close them, and some are designed to make it difficult for users to click on the "X" to shut them down. Apart from interrupting web users' surfing, they have been largely unpopular with many who have found they often contain adult content, unsuitable for younger web surfers.